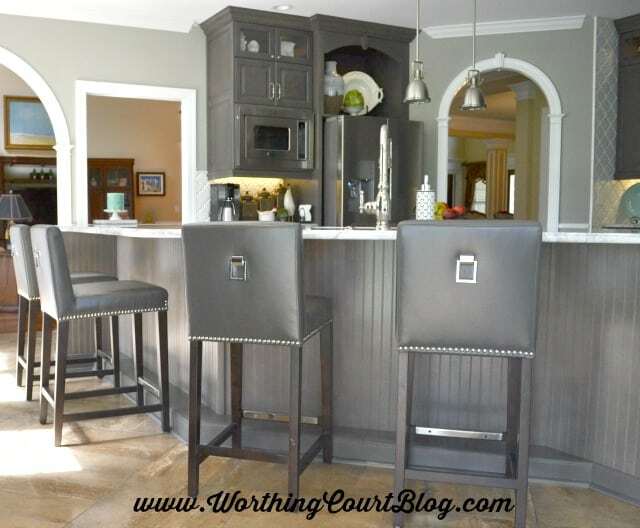 As promised, I’m back today sharing more details and all the resources and colors for my friend, Nancy’s, fabulous kitchen renovation. Enjoy the eye candy first – the full resource list is down at the bottom. 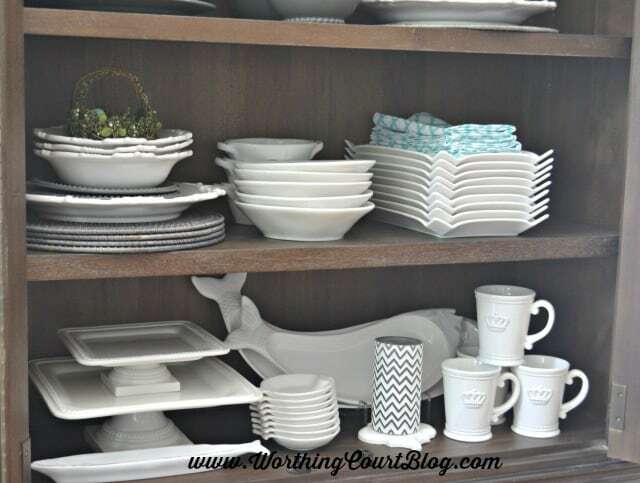 Did you miss Nancy’s new kitchen? Click HERE to take the full tour and to see the amazing before and afters. I thought it would be fun to zoom in and take a closer look at some of the details that went into this renovation. Perhaps you can incorporate some of Nancy’s ideas into your own kitchen. 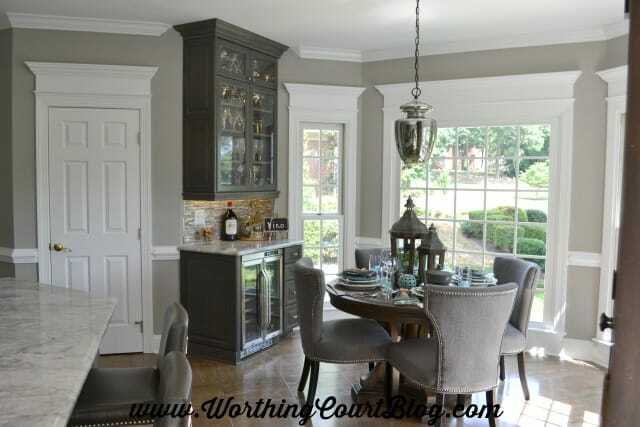 Nancy’s cabinets are custom built so she was able to incorporate some wonderful features. 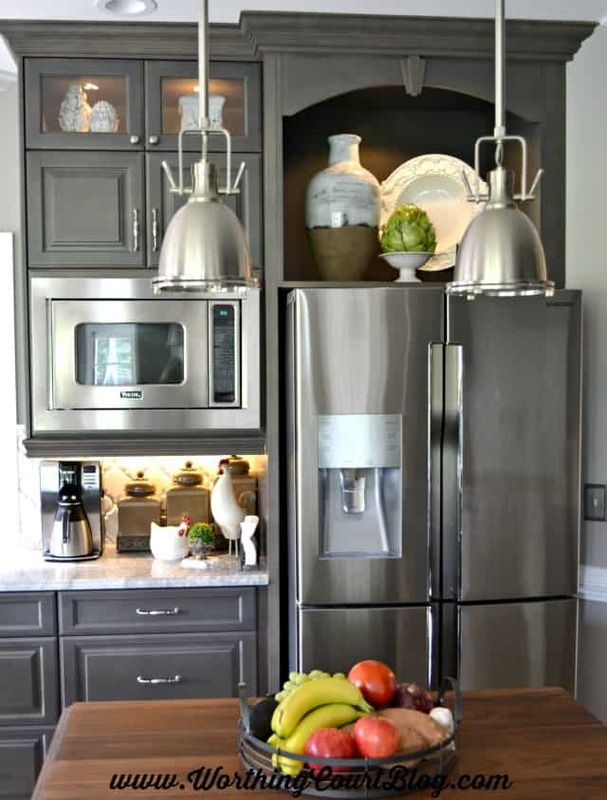 One of them being a lighted, open display cabinet with a keystone detail above her refrigerator. It makes a great place to display special and seasonal pieces. She added a layer of smaller lighted glass front cabinets above the upper cabinets in the rest of the kitchen. The only change that was made to the original footprint, was to move the large angled sink island a few inches. This left an exposed area in the tile which was taken care of by adding a footrest on the backside of it. Beadboard siding adds a layer of dimension and texture. 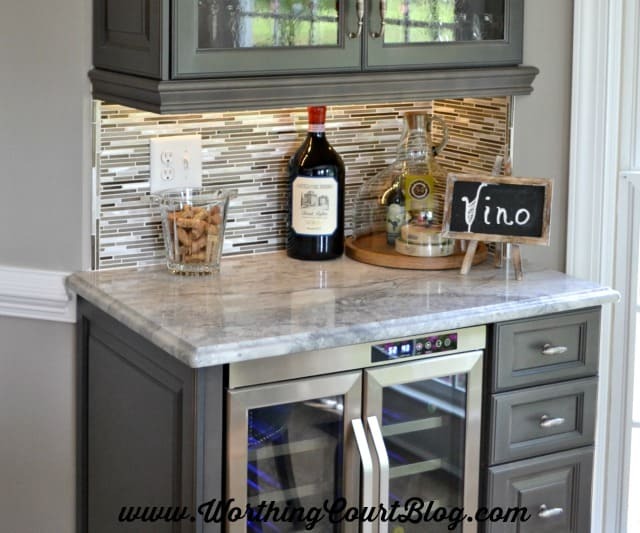 …and the little bit of bling in the glass tile in the wine bar area are the jewelry in the kitchen. 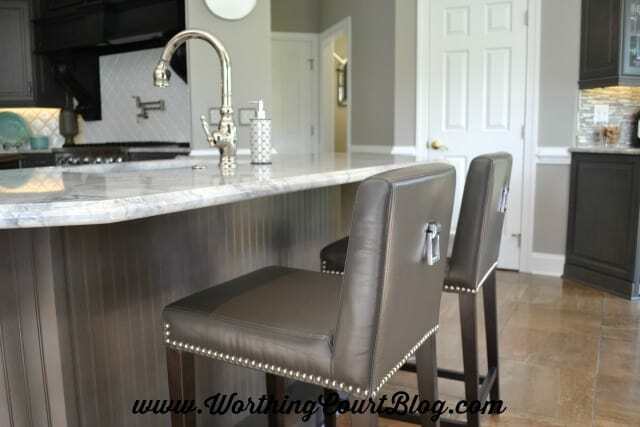 The really cool mercury glass light fixture above the table adds one more bit of sparkle. 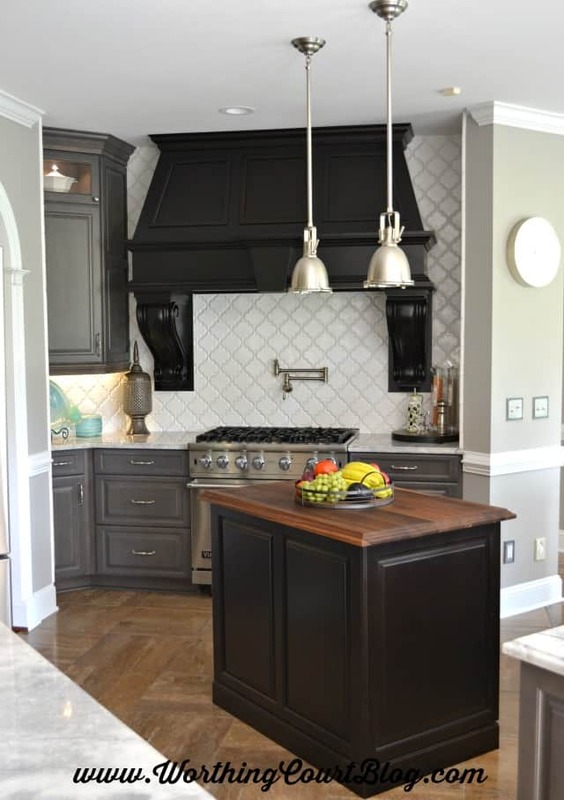 The handmade, white and shiny, arabesque tile backsplash was taken all the way up to the ceiling and is the perfect backdrop for the jaw dropping custom hood. 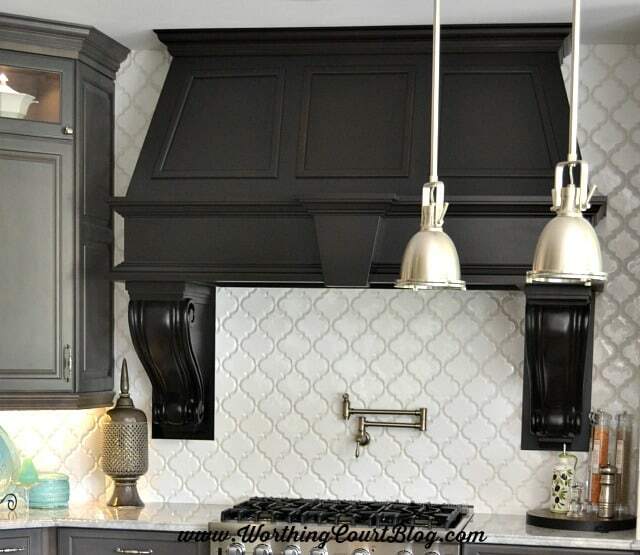 I literally drool over those corbels! 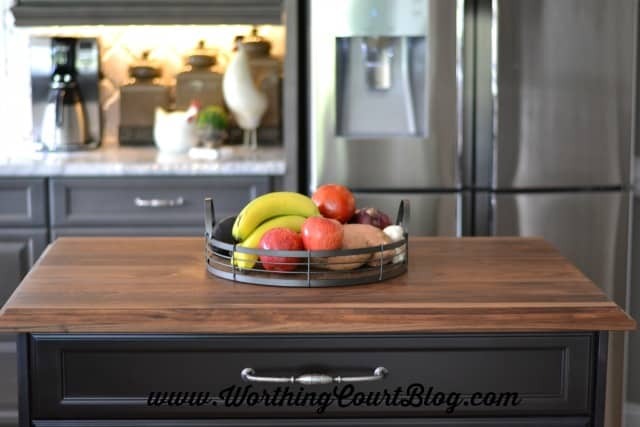 All of the hard surfaces in a kitchen can make it feel cold, but a dark stained piece of butcher block added to the island warms it right up. 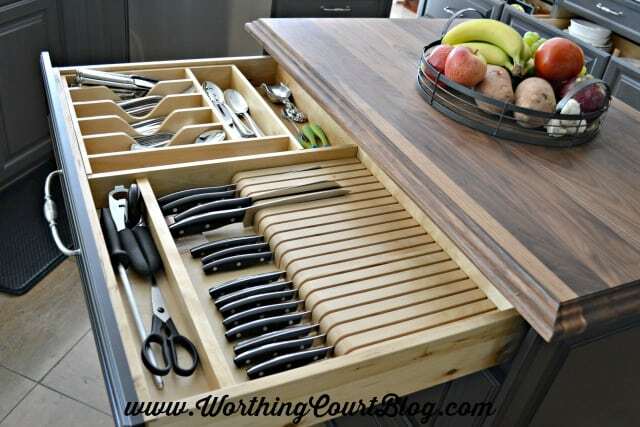 …and a peg organization system to several deep drawers. Nancy opted not to put any window treatments back into the room. Instead, she left the windows bare and visually heightened them by adding easy-to-do trim above the them. The same treatment was carried over to the pantry door and to the rest of the doors in the kitchen. 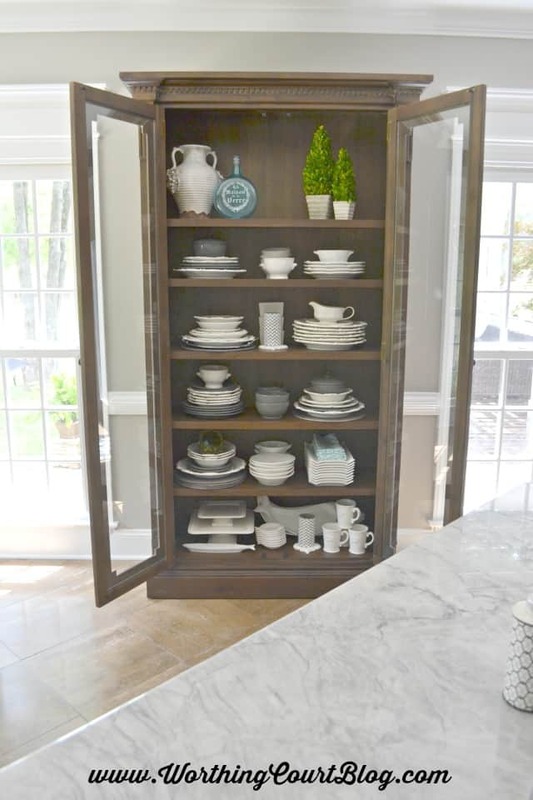 And lastly, Nancy found a beautiful display cabinet to go between the windows on the back wall of the kitchen. 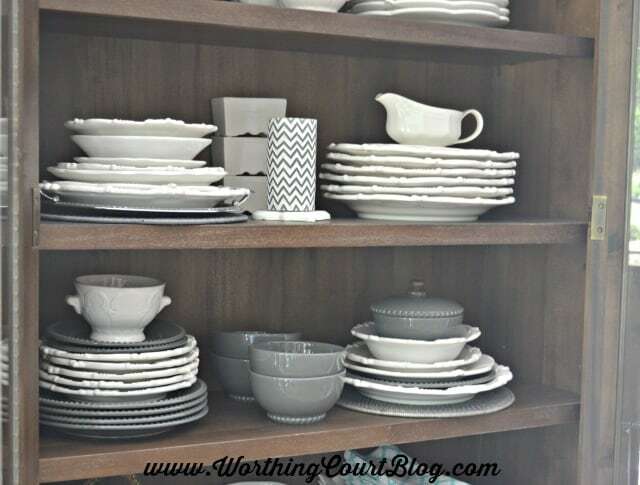 I love the white dishes and accessories mixed with just a few gray pieces. A pop of greenery on the top shelf and a smattering of turquoise brings the whole cabinet display to life. I sure do hope you enjoyed touring Nancy’s new kitchen. A big thank you and hugs to her for allowing me to share it with you. Nancy’s entire home is just beautiful! Click HERE to see more. 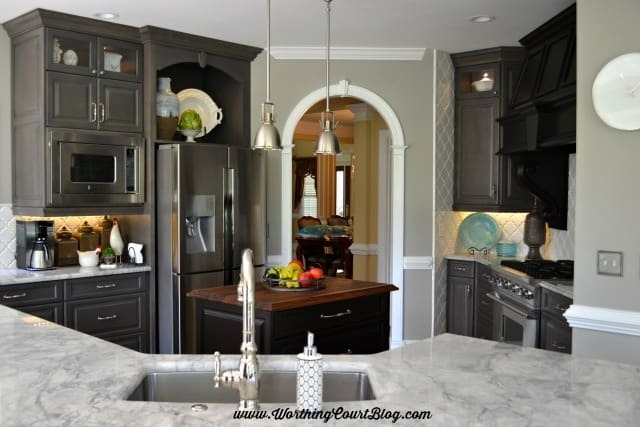 This kitchen is gorgeous!! I love the color palette and how you successfully incorporated grays and browns together. I’m going to go back and drool some more… Great job! Hi Jenny. I think Nancy’s kitchen is gorgeous to! I wish that I could have shown a better photo of her floors, which would really highlight the mix of grays and browns. Is that a counter depth fridge? Hi Christa. No, it isn’t a counter depth one – just normal depth. Hi – I love the kitchen. Could you provide a link to the microwave and build-around for that? What are your thoughts of the function? Hi Vanessa. My friend is unavailable for a couple of weeks so I can’t get a link or find out how satisfied she is with the microwave right now. The brand is Viking, in case you’d like to do an online search for one. The cabinets (including the microwave one) were all custom made by her cabinet builder. I do know that the stainless steel face plate that surrounds the microwave is something that you order/buy along with a microwave that is meant for a built-in look. 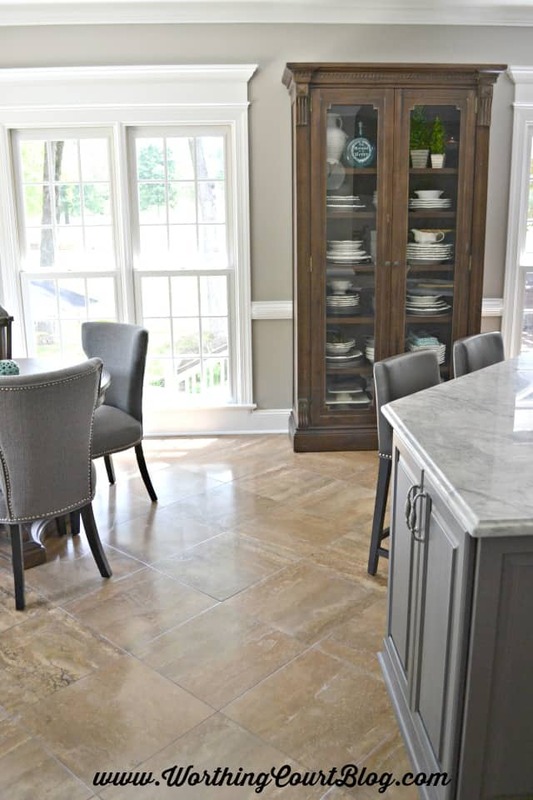 I flip homes in south Dakota and am always looking for trends and upscale remodeling stories. this kitchen stands out. I currently have a dutch colonial that I will be updating. this kitchen is very impressive. the cabinet above the fridge has been used for decorations and not storage.nice. 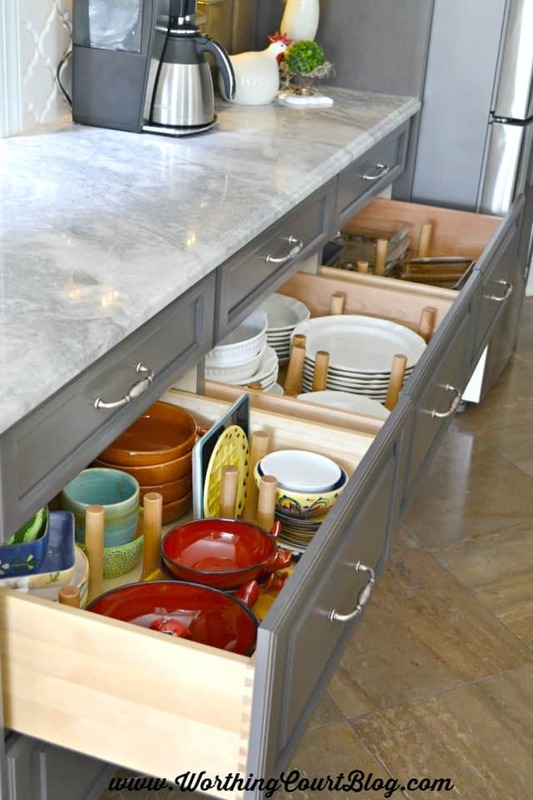 the lower cabinets are primarily drawers and not doors.nice. I am tired of the micro shelf above the range so I feel the built in look of the mic. is very upscale. 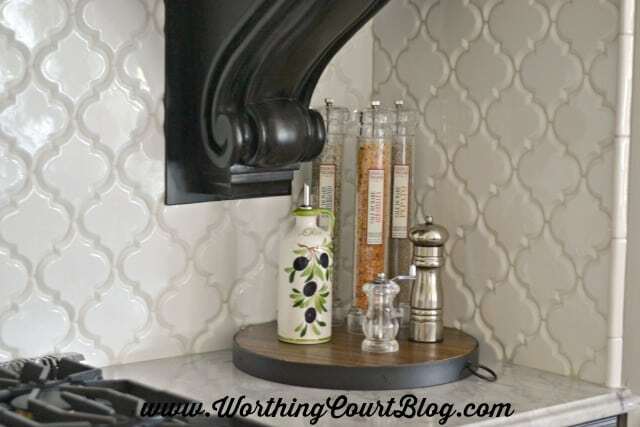 this also allows a decorative range hood. good job. thankyou. it is what I have been looking for.